One of the best and shortest explanations to what Lean really is about, I've found in the "This is Lean"-book by Niclas Modig and Per Åhlström.The thing that made it "click" for me was a diagram that contrasted Resource efficiency with Flow efficiency. I love it! Even though I might have talked about Efficiency versus Effectiveness... Well it's not my book - and that's why it's famous and I'm not, I suppose :).Basically;scoring high on Resource efficiency, for example, is a melting plant for steel. You want that running all the time. You keep a lot of material ready to be processed, because the plant is so expensive to shut downscoring high on Flow efficiency is for example the fire department. Most of the time they have enormous over capacity. Just sitting around waiting until they are needed. We want much less work waiting (none that is) than our capacityScoring low-low (lower left) means that nothing gets done and there's also nothing to do. There's only waste in our process and no value gets created. The dessert if you want.Scoring high-high (upper right) means that work gets done just as it's needed and everyone have just enough to do. There's no waiting times and no waste in our process. One-piece continuous flow is one example of this Nivana-like state. 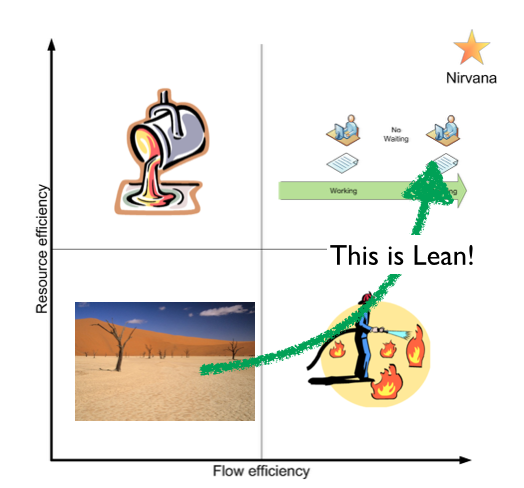 Now, with that diagram in place, we can describe Lean; Lean is a business strategy to reach the Nirvana-state by focusing on flow efficiency. That means, since it's a strategy, that there are other ways to get there. Lean is just one of them. And Lean focus on Flow efficiency.If you think that sounded wise and good it's because it's not me; it's Niclas and Per. Buy the book and thank them.Now I can finally write my blog post. Because for a number of years I've been teaching this, trying to focus on Flow Efficiency. Keep your stock low, limit work in process and move things fast through the process. Which made me the more surprised when I yesterday found myself saying;This should never be empty. In fact I want as many things as possible in here. One of the best and shortest explanations to what Lean really is about, I've found in the "This is Lean"-book by Niclas Modig and Per Åhlström. The thing that made it "click" for me was a diagram that contrasted Resource efficiency with Flow efficiency. I love it! Even though I might have talked about Efficiency versus Effectiveness... Well it's not my book - and that's why it's famous and I'm not, I suppose :). Scoring low-low (lower left) means that nothing gets done and there's also nothing to do. There's only waste in our process and no value gets created. The dessert if you want. Scoring high-high (upper right) means that work gets done just as it's needed and everyone have just enough to do. There's no waiting times and no waste in our process. One-piece continuous flow is one example of this Nivana-like state. Now, with that diagram in place, we can describe Lean; Lean is a business strategy to reach the Nirvana-state by focusing on flow efficiency. That means, since it's a strategy, that there are other ways to get there. Lean is just one of them. And Lean focus on Flow efficiency. If you think that sounded wise and good it's because it's not me; it's Niclas and Per. Buy the book and thank them. This should never be empty. In fact I want as many things as possible in here. At my current "client" we are trying to implement a focus on quality and continuously improving in small steps. Until now it works but I wanted to try to formalise it a bit, so on our board we created a new lane, "Improvements". In the What-column we write what we are trying to change. We only do one improvement at the time, and try to finish it within 2-3 days. Or we break it down further. Why is the rationale for the change. Why did we think this was a good idea? Definition of done - helps us to know when the change is completed, what kind of measurements we will see etc. PIC (Person in Charge) is just the name of the person that we will ask about the status tomorrow morning. The most important, and the reason for the this blog post, part of this lane is to the far right; Nanti (Next). Here is the things that we will try after this improvement. In fact, I want many things in there. After some thoughts I realised the problems with having to many things in the Nanti-column; we don't know what to choose but I rather have to many improvement ideas than no improvement ideas. We will still limit work in process to just 1 item at the time to make the changes small and speedy. We have already seen this very useful and helping us to focus on the improvement at hand (leaving the other ideas to the side for now), encouraging smaller steps and changes. But most of all; always having things that we are improving.